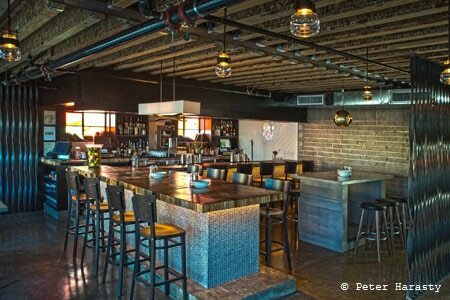 Affordable, upscale comfort food in downtown Las Vegas. : Located in the converted John E. Carson Hotel, one block from Fremont Street, this lively eatery is decorated with exposed, repurposed ceiling beams and a tile wall with the motto “Keep Calm and Kerry On.” A rooftop patio offers skyline views of the surrounding city. The best seats are situated at a tabletop that doubles as an expo counter, offering a front row look into the action in the open kitchen. The highly addictive bacon jam is a sweet and salty mix of smoky pork, onion, peppers and maple syrup, topped with melted Brie. The FGT sliders are composed of fried green tomatoes and lump crab ravigote, while the sizeable jerk turkey burger is quite juicy, with its spicy and savory character, complements of allspice and garlic mixed with mango chutney. Cocoa-espresso New York strip steak pairs with a red wine demi-glace. Finish with glazed donut bread pudding made with donuts, three-rum caramel and vanilla crème anglaise. An eclectic drinks menu includes Anderson Valley Gose Sour Ale, specialty sodas and creative cocktails like the Magarian with Aviation Gin, thyme and honey syrup, lime and Mr. Q. Cumber Soda.